Blog tracking and search company Technorati announced Technorati Topics today, an ongoing stream of blog posts from a selection of authoritative blogs across a range of topics. The section replaces their recently-revamped homepage. 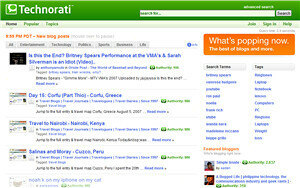 The release of Technorati Topics comes after Technorati’s ongoing hunt for viable ways to organize the world’s blogging information. Categories include Entertainment, Technology, Politics, Business and Life. Posts are refreshed every minute to reflect breaking news, news opinions and latest stories from the web. For selected blogs, this will be a good way to gain visibility, clicks and additional traffic. Blogs are selected on a number of factors, including Technorati Authority, frequency of posting, use of relevant tags, links to related subject matter and general topicality. Meme aggregators like Techmeme may be a good way to know what’s been buzzing in the blogosphere for the day, but Technorati Topics takes it a step further to reflect the latest news to the minute. Some of the dynamic AJAX work, like the fact that you can rollover to pause and the smooth transition when a new item is discovered, is really nicely done. Technorati has undoubtedly a major lead in the blog aggregating field, and if they keep innovating like the way they have, they can expect to keep it. Blogdigger Local: Find Those Rants In Your Area!